Lawmakers from Uganda's ruling party have voted to introduce a bill to abolish presidential age limitations. When passed by parliament, the changes will let President Yoweri Museveni extend his grip on power. Members of parliament from Uganda's ruling party, the National Resistance Movement (NRM), overwhelmingly voted on Tuesday in favor of a formal motion to remove presidential age limits. The move is seen as a thinly-veiled push by Museveni, who has ruled Uganda for more than three decades, to hold onto power. Uganda's constitution currently bans anyone over 75 from becoming president, which stops Museveni, now aged 73, from standing for elections scheduled in 2021. In July, with Uganda swirling with rumors about the possibility of lifting the age limit, Museveni said it was "mere speculation" and that he was "too busy to bother" with the idea. DW correspondent in Kampala, Alex Gitta, said the bill is expected to be formally proposed to parliament this week. Few believe the motion will fail as the NRM holds a two-thirds majority in parliament. However, some independent politicians have promised to do everything they can to stop the bill. "We are ready for a battle within parliament, no one will read that bill," said independent MP Muhammed Nsereko in a fiery speech at a parliamentary press conference on Wednesday. "We shall grab it, we shall tear it, we shall do everything that is possible not to let you speak on that floor of parliament." If passed, the bill will still need to go through the normal parliamentary process of debate, review and a second vote before becoming law. Speaking at the same press conference, Theodore Ssekikubo, one of the few NRM politicians to publicly criticize Museveni, called for the president to retire honorably. "You have done enough, you have done your part. Enough is enough and it is now time to go slow on these matters," said Ssekikubo. On the streets of the capital, Kampala, people didn't see much hope of keeping the presidential age limits in place. 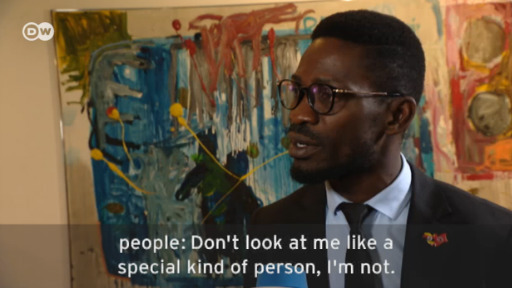 One man told DW he believed Museveni would pay off any MPs opposed to the amendments, while another said the opposition was "wasting their time" because there were so few of them. If successful, the amendment will be the second major change to Uganda's 20-year-old constitution to directly favor Museveni's continued stay in power. In 2005, parliament voted to change the constitution allowing a president to serve more than two five-year terms. Although he came to power in a rebellion in 1986, Museveni ran the country unelected for ten years until 1996 when Uganda lifted its ban on political parties. The 2005 amendments allowed Museveni to stand again. Museveni is now serving his fifth term as Uganda's president, after winning the 2016 elections in a poll marred by allegations of vote fraud. "Museveni was quite appealing when he came [to power] because of Uganda's violent history and the challenges the country was facing. He was kind of a breath of fresh air," Norbert Mao, the president of the opposition Democratic Party, told DW. "But he has shattered our hopes. He manages to stay in power by changing rules to serve him." Additional reporting by Alex Gitta in Kampala.